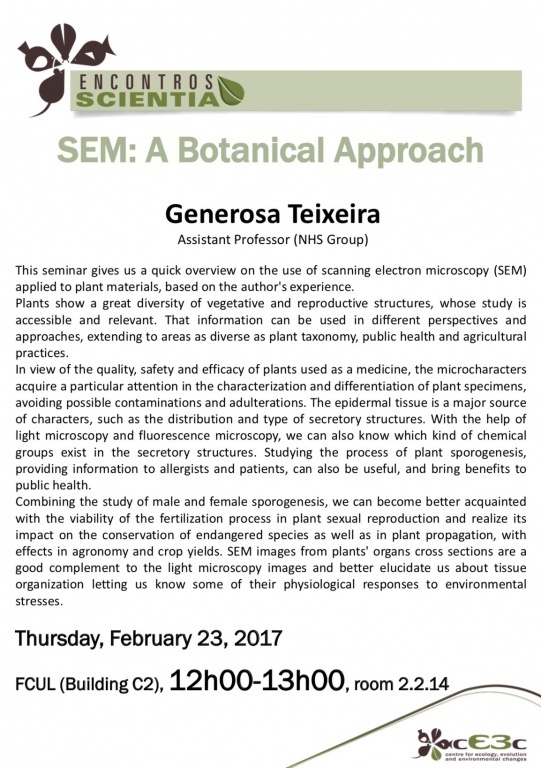 This seminar gives us a quick overview on the use of scanning electron microscopy (SEM) applied to plant materials, based on the author's experience. Plants show a great diversity of vegetative and reproductive structures, whose study is accessible and relevant. That information can be used in different perspectives and approaches, extending to areas as diverse as plant taxonomy, public health and agricultural practices. In view of the quality, safety and efficacy of plants used as a medicine, the microcharacters acquire a particular attention in the characterization and differentiation of plant specimens, avoiding possible contaminations and adulterations. The epidermal tissue is a major source of characters, such as the distribution and type of secretory structures. With the help of light microscopy and fluorescence microscopy, we can also know which kind of chemical groups exist in the secretory structures. Studying the process of plant sporogenesis, providing information to allergists and patients, can also be useful, and bring benefits to public health. Combining the study of male and female sporogenesis, we can become better acquainted with the viability of the fertilization process in plant sexual reproduction and realize its impact on the conservation of endangered species as well as in plant propagation, with effects in agronomy and crop yields. SEM images from plants' organs cross sections are a good complement to the light microscopy images and better elucidate us about tissue organization letting us know some of their physiological responses to environmental stresses.